To make a professional impression, use the ruler, guides, and grid to arrange and position shapes neatly in your drawings. To show the Ruler, select View and select the Ruler checkbox. To hide the Ruler, select View and clear the Ruler checkbox. To show Guides, select View and select the Guides checkbox. To hide Guides, select View and clear the Guides checkbox. Drag a guide from the horizontal or vertical ruler onto the drawing page. Drag a shape to the guide until a connection point on the shape snaps to it. Drag a guide to move the shapes connected to it. To remove a guide, select it and press Delete. To show the Grid, select View and select the Grid check box. 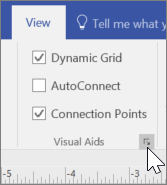 To hide the Grid, select View and clear the Grid check box. Select View > More > Snap & Glue. Select the Snap to options you want. To snap shapes to the grid, select Grid. To snap shapes to guides, select Guides. To snap shapes to rulers, select Ruler subdivisions. To view a drawing in full-screen mode, Select View > Presentation Mode. To move from page to page, select a blank area of the drawing. To close presentation mode, press Esc. Precision matters in floor plans and other architectural documents, so structural tools, like the Ruler, Grid, and Guides, are important in fine-tuning my work. The Ruler provides vertical and horizontal measurements at the scale of my diagram. To show it, I go to View and select Ruler. As I move a shape, like this Room, corresponding lines show its position on the ruler. I select Guides to help me align shapes with each other. To place a guide, I select a point on the ruler and drag it onto the diagram. Then I drag shapes to the guide to snap them into place. If I move the guide, the shapes move with it, retaining their spatial relationship to each other. When I no longer need a guide, I select it, and then press Delete. I select Grid when I want to align shapes more precisely. Shapes snap into place on rulers and the grid. When I want to turn snap on or off, I select the More arrow in the Visual Aids group. I make sure Ruler subdivisions and Grid are both selected in the Snap to column when I want to snap shapes to the ruler and the grid. Snap & Glue settings apply to all shapes in the diagram. To unclutter a finished diagram, I sometimes hide guides, rulers, and the grid by clearing the check boxes. When my diagram is almost done, I select Presentation Mode on the status bar to see exactly how it will look. It looks exactly like I want it to, with all the spaces aligned.